Question: Are zombies more effective (scarier, convincing, etc) when they stumble along, or should they be able to run? I stumbled across this article in which Simon Pegg complained about the "faster" model of zombie. Is the old fashioned, slow moving corpse more effective than the "post 28 days later" runners? I want feedback. Re: Zombies: Fast or Slow? If the zombie-geddon ever gets here, I'd much rather the slow-goers myself. Though I can see the appeal to the shamblers as far as suspense goes, especially when they gather in a massive wave of bodies that slowly closes in on you and your tasty brain, I think the running dead are much creepier in the sense of "Holy sh!t! How can you escape something like that!?" I still think that the original Return of the Living Dead is definitely one of the freakiest living dead flicks for that reason. 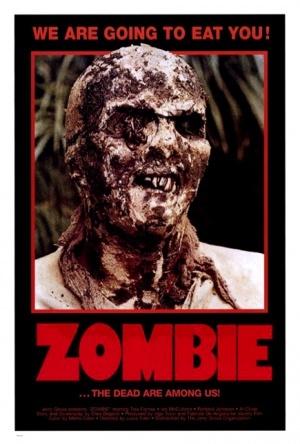 At a time when horror movie fans were getting comfortable with the idea of knowing what they would do in the case of a zombie movie attack, here comes an army of unstoppable corpses, running screaming through the streets like rabid dogs, motivated entirely by searing pain that can only be cured with cracking open your head and eating your brains. Yikes. To me, the 28 Days Later archetype weren't really zombies, but virus infected people. They weren't the living dead, they had heartbeats and didn't rot. I think Pegg nailed it. Zombies are corpses, the ultimate symbol of death. You're stronger than them, faster than them, smarter then them, but the second you catch a glimpse of a horde of them shuffling towards you, you know it's all over. It's only a question of how long you can hold out before they bury you under their massive weight and make you one of them. If your monster is fast, make him some sort of predator instead of a zombie. Slow zombies, always slow zombies. It's not only better in a movie but more realistic, as far as realism can go in a zombie movie. i honestly don't care, and it sort of bothers me when people act like this is a big deal. it only matters if they're going to use fast zombies and still try to create a "dreadful atmospheric"-type zombie movie. 28 days later was a good example of where fast zombies (yes, i'm calling those zombies. sue me.) worked just fine, because the film didn't try to work contrary to their being more active. Just watched Dawn of the Dead Original and Remake, and I gotta say, both are freaky in their own way. My emotional preferance is for slow zombies [that way my Zombie Survival Guide is not made redundant] and a massive horde of slow moving zombies that endlessly pursue you across miles and miles is quite a statement. But let's face it: if zombies are fast then we're all completely buggeredo! Slow we can face, fast, well, that will make the infection spread like wildfire! So which do I prefer? Slow zombies I like, but which scares me more? Fast baby! I concur with the previous posters. Running zombies might have a place (Like daywalker vampires), but the movies are best when the corpses main threat comes from their numbers. I think the votes speak for themselves. Everyone has been used to slow zombies, that image of the undead. It's ingrained in our minds that, that's the way they are supposed to be. Death has set in, rigur mortis and decay, limbs would not function with such ease. You only have to look at films like the original "Of The Dead" trilogy, to see that it works best with them slow. It creates more suspense as characters are scared and have to plan their movements carefully and any over confidence or lack of concentration can ultimately lead to their grisly demise. I agree with Dean, if the zombies are fast, you've basically got no hope. The whole idea of zombies is that they're the living dead, not very physically fit after spending all that time in the grave. There's lots of them, and they're coming after you. It's a claustrophobic thing. With running zombies you've pretty much got a horde of murderers after you. Unless you've got a bunker and thousands of rounds of ammo, it's not very realistic to think that anyone could survive for long at all. Fast zombies are missing the point of what makes zombies so great to begin with. I prefer slooooooow. I mean they are the "standard". If they are fast, you really have no chance, but when they're slow, their threat comes from their numbers, as Mr. Briggs Inc. said. So please support the slow zombies. How could you say "no" to those eyes? There seems to be a lot of "dead are supposed to be slow" talk in the air, but there is also quite a lot of "faster are freakier" talk floating in the vicinity, so how about a compromise that will get the best of both worlds? I've always thought that the longer a zombie has been dead the slower it should be, so how would you react to a zombie flick in which the recently dead are fast, nimble and deadly and the more rotten ones are slow and rely on the strength of numbers to catch their helpless (and soon rather brainless, I'm afraid ) victim? That would be, in my opinion at least, a perfectly balanced and very scary zombie movie. Very good point, that makes perfect sense. Re-animator is a perfect example, the fresher the corpse, the quicker the transition back to life and full movement.